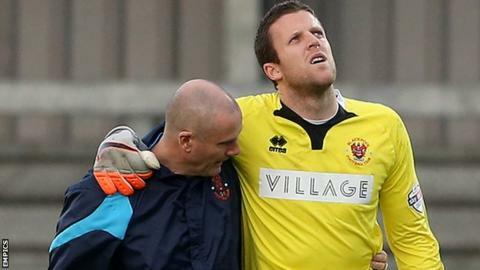 Blackpool goalkeeper Colin Doyle will be out until the start of 2016 with ankle ligament damage. The 30-year-old was taken off in the Seasiders' loss to Barnet in the FA Cup and will now miss around two months with the injury. Boss Neil McDonald has already said he is looking to bring in a goalkeeper on loan after back-up keeper Kyle Letheren injured his collarbone. Doyle moved to the League One side in June after his release by Birmingham.